I killed my first chicken when I was five. My Aba (grandfather) thrust its knobbly feet at me, and told me hold on tight and with one smooth, practiced motion he twisted its neck off, drained the blood and dunked the whole bird into a vat of boiling water. Fast, clean, precise – and I didn't even blink through the whole process. Plucking the bird afterwards wasn't great, but my little fingers made fast work of those little pin feathers, much faster than Aba's gnarly, work weathered hands. Showing that dexterity may have been a mistake, though, since I was always, thereafter, made to do the feather plucking – easily the most boring job ever, especially for a hyperactive five year old. After that first time, Aba and I have killed more chickens. I didn't see him all that much, as we lived in town and he lived in the small village he called home. But every summer my sister and I were unceremoniously bundled into a bus, and packed off to my grandparents' place where we ran wild with all the other neighbourhood kids. Our school holidays were during April and May, and May was wedding season. Aba was a wedding chef, and a master butcher, which meant that he was out almost every night, if it wasn't a wedding, it was a christening, a jubilee celebration, a church event. My grandmother would also be invited, and a lot of the time we tagged along. The wedding feast usually started with a ceremonious parade of all the live animals and birds that would be served at the feast. They would be taken to a nearby farm, or abattoir, where my grandfather, along with other males in the wedding party, would butcher them. Aba would then expertly chop everything up, and start the long cooking process that officially marked the start of the wedding feast. Everyone had a job, and with the precision of a seasoned chef, he made sure everything was being sauteed, simmered and salted to perfection. It was hot, dusty and pots and pans clanged, and fires flickered and spit and sizzled. The air was thick with the smell of cooking, a hundred different aromas, somehow blending harmoniously and wafting into the surrounding homes and villages. Candles dripped wax, and eerie shadows danced on soot stained fire pit walls. In the middle of it all, my Aba, a commanding presence, striding to where ever he was called, never once sitting down, never once consulting a recipe. The cooking went late into the night. We wandered around, bored, but excited at the same time. Around midnight, we would usually be found curled into a ball in a corner somewhere, fast asleep. We almost always woke up at home, and for the life of me, I don't know who carried us back and tucked us up into our sleeping straw mats. Aba came back the next afternoon, once the wedding was done and all the food was served. We would be up and chirpy, we knew there were leftover wedding food in his bags that we would eagerly dive into. We were then dispatched outside so Aba could sleep in peace, and the process started all over again the next day. Aba never did everything by himself. I held the chicken's feet and plucked feathers. My sister ran around like a headless chicken (sorry, that pun was unintended.) Aba had specific jobs for everyone. He supervised, but he let everyone do what they were supposed to. I still have to learn that that life is a team effort. We rely on so many people, we have to trust people to look out for us too, just as we would do the same for them. But when things get hectic, I don't always ask for help or support, I stubbornly feel like I can do it all on my own. But Aba made me realize that it's okay to reach out to people, and talk to them, and ask for support. These memories don't come by that often anymore. My life is busy, and stressful, with deadlines, journal issues, recipes and family. I worry about everything, and wonder how I am going to continue juggling all these balls in the air, while making sure that nothing gets overlooked. Which is when I start writing. Writing takes my demons away. Thinking back on a slower time, a simpler life, helps me take a deep breath, prioritize, listen to others and calm myself down. It's important for my sanity, and I just haven't been doing enough of the writing and memories in the past few months. It's time to go back home. It's time to write for the joy of writing again. I made these wings for mom, as we were both craving spice. 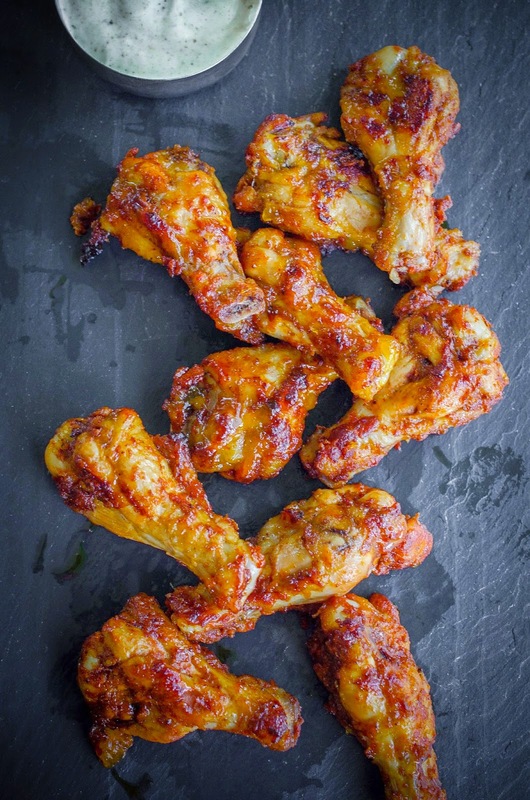 We devoured these spicy-sweet tikka wings, hot, straight from the oven. Once we were done and were licking the stickiness off of our fingers, mom turns to me and says, 'You are your Aba's granddaughter after all'. I want to cry, because I miss him so much. There was so much more I had to do with him, that I didn't, so much I needed to learn and I haven't, so many techniques I had to master and it is too late now. But Aba's death taught me an important lesson and I now cherish every moment with my loved ones. I learn, I listen to everybody's stories, and I understand that life is more than a rat race. I love. Aba taught me that to love what you do is what gives you that edge in this crazy world we live in. I count myself lucky that I am able to say that I love waking up in the morning and doing a job that fulfills me, and I just have to stay grateful for this. Cut the tips off the chicken wings. Trim any excess skin off the wings and drumettes and keep aside. Whisk together the oil, yogurt, tandoori masala, garlic, ginger, lemon juice and salt in a large bowl. Taste and add more salt, if required. Add the chicken wings and drumettes to the bowl, and rub marinade into the pieces, until well coated. 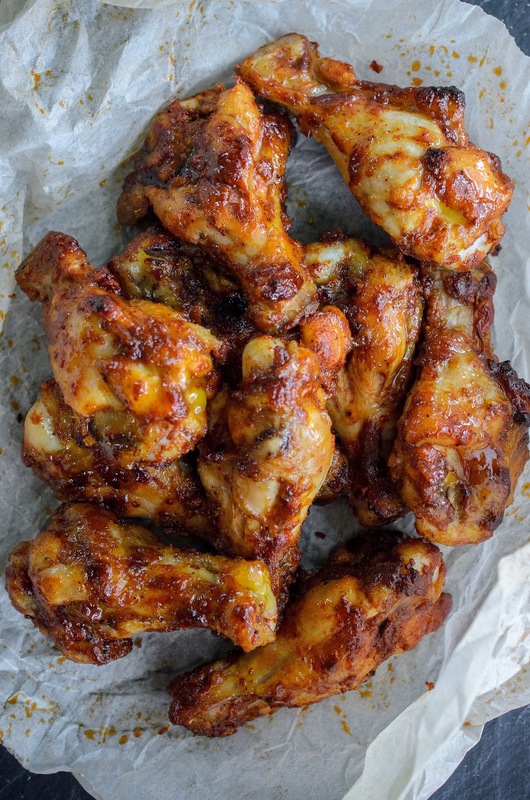 Let the wings marinate for at least 4 hours, ideally overnight. Place the oil in a small saucepan, and add the garlic, ginger and chili flakes. Saute for about 30 seconds, until fragrant, then add the mango chunks, sugar, vinegar and salt. Cook together on a medium low heat for about 20 minutes, until the mango is very soft. Crush everything together, using a potato masher, then cook for an additional 5 minutes. Taste, and adjust seasoning. Keep aside until ready to use. When ready to bake, preheat the oven to 400 F.
Bake for 40 minutes, turning once. In the last ten minutes of baking, brush the chicken all over with the mango-chili chutney and continue to bake. To make the yogurt raita, whisk the yogurt with the cumin, garlic and salt. Taste and adjust seasoning. Serve the tikka wings hot with any remaining mango chutney and the yogurt raita. These sound awesome...especially with the mango chilli glaze! A very large amount of these right now would go down SO well. Preferably with loads of extra mango chutney for me. You're so right that writing takes the demons away. I've got to find more space for a bit of writing. This looks delicious!!! I love wings! Beautiful story-telling. I can picture it all :-). And the recipe and photos look amazing too! I wanna reach right into the screen on gnaw on a wing! Oh my goodness! That chutney! With mango it must be exquisite! I love the recipe but the story is what hits home for me. My grandparents are my world, I grew up with them and learned many life lessons from them. Yum! These look so good and I just by chance bought chicken wings from the butcher today. Thanks for sharing your memories it was a beautiful story!